You have finally found that application that you have been searching for for so long, and you have found out that it is only available in English. This is when non-English people start to get fed up due to the language barrier. And although the menus of many applications in English are easy to figure out, on certain occasions it is important to understand their meaning to make the most of the program. In these cases you can use LingoWare, a multilingual translator that will let you enjoy applications in your native language or in English. 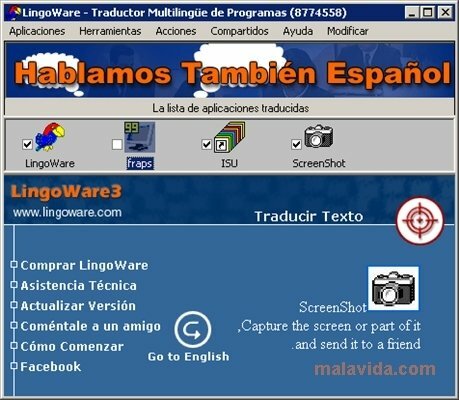 LingoWare translates the English user interface of any application almost instantly. 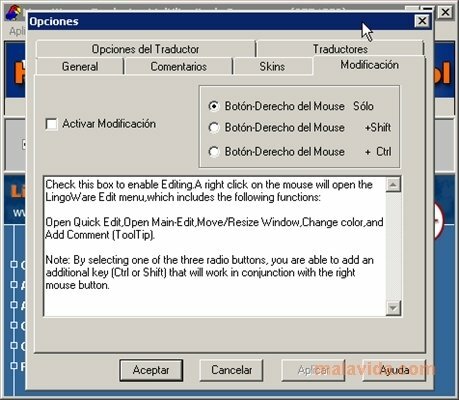 All you have to do is drag and drop the application's icon on top of the LingoWare parrot icon on the taskbar, and the translation application will translate all the text into your native language. If you want to obtain a more precise and correct translation, you can search on the application's website, to see if you can find a specific translation for that application. On the website you will be able to find translations by the official translators that work on the application, and translations that have been uploaded by other users. This is a trial version that can be used for 4 days with limitations. A free inscription has to be carried out after the installation. It is impossible to translate the texts inserted as images.